As I recently wrote here at Paste, my favorite memories of childhood are of watching old cartoons from the golden era of animation. Imagine my delight, then, when I first laid eyes on Cuphead. This vintage-inspired darling, though difficult to complete, has won over fans and critics alike, showcasing the developer’s remarkable talent for reverse engineering the style of Fleischer Studios and Walt Disney’s earliest work. I caught up with brothers Chad and Jared Moldenhauer, the duo behind Cuphead’s creation, to ask them about the cartoons that inspired the game, and find out what their favorites have been over the years. Here are ten films to watch if you want to relive the look and feel of Cuphead. It’s by now well known that “Bimbo’s Initiation,” considered by animators as one of the best cartoons in history, served as a primary source of inspiration for Cuphead. Released in 1931 by Fleischer Studios (a favorite of the Moldenhauer brothers), the film exemplifies some of the key characteristics the Fleischer cartoons would come to be known for, from its facial expressions and goofy slapstick to its dive into dark surrealism (prompting pop critic Leonard Maltin to call it “the darkest” of all the Fleischer cartoons). Bimbo would later star in other Fleischer Studios films as well, as the boyfriend of Betty Boop, who also appears in this short and played a major role in developing the aesthetic of Cuphead. He was later phased out as the Hayes Code, a 1934 law that imposed morality standards on the production of entertainment, was enacted, as the idea of a dog dating a human woman was frowned upon. Another Fleischer Studios hit was the Popeye series of cartoons, which started when E.C. Segar’s comic strip Thimble Theatre was optioned into film in late 1932. While “Popeye The Sailor,” the original cartoon that started it all in 1933 (with a cameo from Betty Boop), was a fine hit, 1936’s “Popeye Meets Sinbad the Sailor” is even more well regarded, especially for its lush, full color glory. Like many others on this list, it is also considered one of animation’s fifty best cartoons of all time, and was nominated for an Academy Award in 1936, losing out to “The Country Cousin,” a Silly Symphony. Directed by Dave Fleischer, who Chad and Jared tell me is their favorite director, the film was one of three longer cartoons billed as Popeye Color Specials, including “Popeye the Sailor Meets Ali Baba’s Forty Thieves” and “Aladdin and His Wonderful Lamp” (1937 and 1939, respectively). While the racial sensibilities of the latter two are wildly outdated, they probably served as at least partial inspiration for Cuphead segments like Djimmi the Great. You can see elements of Popeye’s influence throughout Cuphead, but perhaps most clearly in the boss battle with Captain Brineybeard, who strongly resembles the Popeye antagonist Bluto. 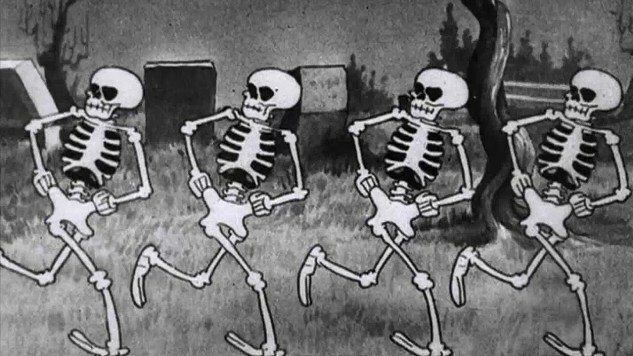 Walt Disney and Ub Iwerks’s “The Skeleton Dance” was the first Silly Symphony, a series of technically innovative cartoons in the late ‘20s and 1930s that expanded the artistic range of the medium, and which would heavily inspire the look and feel of Cuphead. Like many Silly Symphonies, it is heavy on psychedelic and often supernatural imagery, such as that seen in the Cuphead boss fights Phear Lap and Phantom Express (scenes also reminiscent of the 1937 Mickey Mouse short “Lonesome Ghosts”). Some of Iwerks’s animation from the short would later be used in “Haunted House,” a 1929 Mickey Mouse film that also feels reminiscent of Cuphead’s macabre and spooky touches. For another glimpse into the heavy influence of early Disney cartoons in the making of Cuphead, take a look at the 1929 film Hell’s Bells, where you’ll see characters that almost undoubtedly served as the model for The Devil and perhaps other bosses, like Grim Matchstick. You can also see more scattered throughout the Silly Symphony filmography, a chronological playlist of which you can find here. The brothers cite “the artistry” of Disney’s Silly Symphonies as one of the strongest influences behind Cuphead. Of the 75 cartoons that were ultimately produced in the series, the finest example might be “Flowers and Trees” from 1932. Here the background is where the art truly shines, and as you watch, take note of how well Cuphead recreates the faded watercolor look. The quality is no accident—in his talk during GDC 2017 about animating Cuphead, Jake Clark reveals that they drew the game’s characters and animations on actual paper and did real watercolor work to match the look of the era perfectly. Originally “Flowers and Trees” was produced using a two tone Technicolor process and was 60% completed before it was scrapped and restarted in favor of using a new three tone Technicolor process instead. It would go on to win an Oscar at the 5th Annual Academy Awards for Best Short Film Subject (Cartoons) in 1932, the year the category was introduced. It serves as an early example of the anthropomorphizing that would become all but a staple of animation in the decades to come. Of their favorite animation studios of the 1930s, Jared and Chad say Disney is their second favorite, “for how far they pushed artistic boundaries”. And of all the Mickey Mouse cartoons to debut during the decade, the presence of 1935’s “Mickey’s Garden” can be felt the heaviest, especially in boss battles like “The Root Pack” and “Cagney Carnation”. As with “Flowers and Trees,” the background watercolor detail is particularly expressive and appealing. Following “The Band Concert,” “Mickey’s Garden” was the second Mickey Mouse cartoon to be shot in full Technicolor, which Disney had previously held off on, preferring to limit its use to the Silly Symphony cartoons to boost their popularity. “Thru The Mirror,” from 1936, is one of the most charming of the early Disney cartoons (paving the way for the tremendously wonderful full feature animated film Alice in Wonderland in 1951), and one of my personal favorites. Possible influence from this film can be seen in the boss fights with Hopus Pocus and Pirouletta, and other casino or card themed touches like the character design of King Dice. As a Fleischer Studios character, a variety of Betty Boop cartoons likely played a part in inspiring Cuphead. Indeed, a flash of “Chess-Nuts” can be seen in Jake Clark’s GDC talk about the game’s animation, where he also reveals that Betty Boop’s design was a major influence on at least one of the game’s major bosses, “Cala Maria”. The best of her cartoons were arguably in the first three years following her debut, before the Hayes Code (which dramatically altered her appearance and demeanor) was enforced. Of those, “Snow-White” is perhaps the best, the result of six months of work by Fleischer Studios lead animator Roland Crandall, and considered one of the best works of the golden era of animation. Of particular note is the film’s imaginative and detailed backgrounds, a strength that Cuphead has in common with the cartoon. If you want more of Betty, you can also check out 1932’s “Minnie the Moocher”, also considered one of the greatest cartoons of all time. It co-stars Bimbo, whose other films also played a role in the aesthetic of Cuphead, and who Chad and Jared tell me is their favorite recurring Fleischer Studios character. You can also see Betty Boop in her earliest appearance in “Dizzy Dishes,” where her character originated as a jazz singing dog. As you watch this 1936 Fleischer Studios cartoon (cited elsewhere as among the many to shape Cuphead), you may see a lot of different faces and characters that remind you of a wide swath of Cuphead villains. It’s strongest resemblance however is to the boss battle Ribby and Croaks, a segment that features a lot of merry lookin’ little flies also seen in the short. Another bug-centric film cited by the creators is Disney’s 1938 cartoon “Moth to a Flame,” which Cuphead animator Jake Clark confesses served as another model for the boss Cala Maria. If there’s a single cartoon responsible for Cuphead, undoubtedly it is “Swing You Sinners!,” which Chad Moldenhauer, also the game’s art director, says is the biggest influence on his art style. Released in 1930, its legacy as one of the most surreal and convention-defying cartoons of all time remains to this day. The team’s pursuit of the look and feel of it, and other Fleischer Studio creations, has been so authentic, they tell me, “A descendant of the Fleischer family did reach out mid-way through development to applaud the work done in our attempt to recreate the look from those cartoons, so that was a big moment for us. Also our licensing partner talks directly to other members of the Fleischer family, who have all shared the same sentiment.” In other words, Studio MDHR has created such a fine tribute to the 1930s, even those closest to the Fleischers can appreciate the quality and attention to detail, making the nostalgia surrounding this sentimental hit somehow even sweeter. Holly Green is the assistant editor of Paste Games and a reporter and semiprofessional photographer living in Seattle, WA. She is also the author of Fry Scores: An Unofficial Guide To Video Game Grub. You can find her work at Gamasutra, Polygon, Unwinnable, and other videogame news publications.